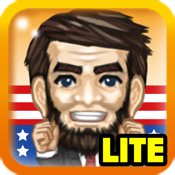 President Story is a simulation game of the United States Presidential Campaign. Build your team of talented people; train them so they can work effectively to boost your reputation. Once you have accumulated enough reputation your party will nominate you for the presidential election. Strive to gain votes from every state by satisfying the people's voice , and eventually beat the opponent to become the president of the United States!